Salsa Eating Salsa: Sunday surprise: mini crawfish boil! Walking through Chinatown on Stockton, I wandered in and out of a few fish markets-- always fun to poke at the live crabs, frogs, and turtles. 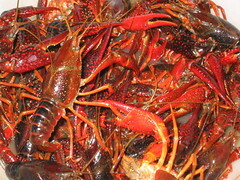 One shop had the best surprise in a big box at the front of the store-- live crawfish! Even though it was 2:30, I hadn't had lunch (figuring I'd stop at Little Paris for a sandwich or pho), and my late lunch mission was clear: I needed to boil some crawfish! I'll post the name of the market later-- they were all very nice, the owner asking me what I would do with them. I said "I'll boil them spciy-- I'm going home right now!" and took off with 2 lbs of the suckers. 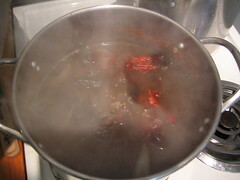 When I got home, I put a pot of water on the stove immediately, then rinsed the mud off the crawfish in a big bowl, then looked up a boil spice mix recipe-- I didn't have Zatarain's. I do not recommend the recipe, but it got the job done. Tip: spraying water on a crawfish's underside makes it slap its tail against its belly. 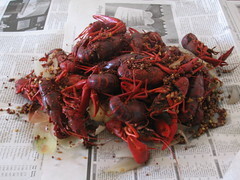 It was fun playing with the crawfish, and I was tempted to keep the biggest one ("Jacques"?) as a pet... but mercy came and went, and they all went in the boiling water. Fifteen minutes later, I dumped out a dainty, dirty pile and had at 'em. In no time, I'd grabbed, twisted, ripped, sucked, and bit everything I could.